Yes, the turkey and some baking is awaiting for me; but I do not want to miss this last post on this last chapter of this wonderful book, The Holiness of God, by R.C Sproul, so while every one is still in bed, I will type. For me this is a very important chapter because it brings down to today, down to this moment, down to the place where I meet my God, His Holiness. This is where we are as Christians, as believers, as seekers of His face; we are in a daily quest to be more like Him, to love Him more, to find Him more in every minute that frames our life. "We seek a threshold that will lead us over the border from the profane to the sacred. It is a quest for sacred space, for ground that is holy ground"
We want that. We don't want to be trapped in the moment, in the running, in the to-do list, we want to walk beyond to the transcendent because we know our God is transcendent; because we know that what we do here, today, right this moment has a transcendent consequence. But I live here, I live in squares in a calendar, in hours made of 60 minutes, and here, in between this keyboard and baking muffins, and kissing the forehead of my children, in between teaching Spanish and the life of Leonardo DaVinci; and snapping pictures here and there; in between making beds and making love with my husband, I live in Holy Space and Holy Time, because God has come to meet me here, where I do my life. Sproul reminds us that the "holy space Moses occupied was made holy by God's presence" , and isn't my home a holy space too? And it is holy not because we, this family which I love so much, is sinless, NO! it is because God has come to us. He has reached us. His presence abides in us; among us. "Our contact with the holy is not merely an encounter with a different dimension of reality; it is meeting with Absolute Reality. Christianity is not about involvement with religious experience as a tangent. It involves a meeting with a holy God, who forms the center, or core, of human existence. The Christian faith is theocentric. God is not at the edge of Christians' lives but at the very center. God defines our entire life and worldview"
Am I a Christian? Do I live meeting with a holy God every day all day? I am planning to make a nice turkey for our family and their favorite cookies will soon be in the oven; is God there? I slice an apple, and chop some chocolate; I pray to my God. I give thanks for His goodness. He is here, in the moment, in this place, my kitchen. I wash the dishes again, and again and again... I can complain and be ungrateful, or I can pray I find in that moment, a sacred moment. Dr. Sproul reminds us also of two holy times that frame our lives as Christians; the Sabbath and Lord's Supper. "Each Sabbath day, believers observe sacred time in the context of worship. It is the keeping holy of the Sabbath day that marks the regular sacred time for the Christian. The worship service is a marking of a special liturgical time. 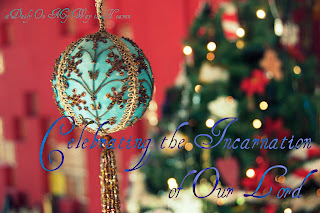 Because of the reality of the Incarnation, history itself becomes sacred for the Christian. We mark our calendars with reference to time that is B.C or A.D. We have a theology of history because we realize that there is a holy purpose to history, even our salvation"
And the our pretty wall calendar is coming to an end; and a new one is in the mail. We filled squares, we have filled until today, 357 more days under His sun. We have walked in history. We have been part of that Sacred History that He wrote. And we like to talk about new purposes for the next year... what about today? Why not right this moment? Why not just live in Holy space and Holy time every day? Acknowledging His presence with in us, among us. Sabbath comes not at the end of the week, but at the beginning of the week to remind us that the day we'll stop breathing under His sun, rest will not be the last thing we do, but the first thing of our new life not under His sun, but under His glory which shines brighter than the sun! "First, it looks to the past, instructing believers to remember and to show forth Christ's death by this observance. Second, it focuses on the present moment of celebration, in which Christ meets with His people to nurture them and strengthen them in their sanctification. Third, it looks to the future, to the certain hope of their reunion with Christ in Heaven, where thy will participate in the banquet feast of the Lamb and His bride"
I have a day ahead of me, I want to live it in sacred space and sacred time; I want Him to be my all in all every minute, every tic-tac; here this place, this home is sacred because He has come. I don't want to miss Him. "In sacred space and sacred time Christians find the presence of the Holy. The bars that seek to shut out the transcendent are shattered, and the present time becomes defined by the intrusion of the holy. When we erect barriers to these intrusions, dikes to keep them from flooding our souls, we exchange the holy for the profane and rob both God of His glory and ourselves of His grace"
May our lives be flooded with His Holy presence. Thanks to Tim Challies, who has put together this reading group, and thanks to you who read along! I look forward to the next book! Image from my photography blog, have you visited it? This post is linked to Fields of Faith, because I have found that my field of faith is here, today!